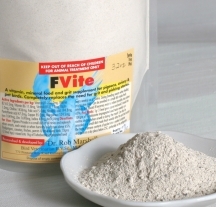 Trace Minerals belong to a group of nutrients that are needed by the body in very small amounts. They are necessary for oxygen transport, energy metabolism, growth, and cell and nerve protection. They are essential in the assimilation and utilization of vitamins and other nutrients. They aid in the digestion process and provide the catalyst for many hormones, enzymes and essential body functions and reactions. They aid in replacing electrolytes lost through diarrhea. Certain plants can be rich in some minerals. The problem is that we have farmed large portions of our farmlands for hundreds of years without replacing the minerals that were removed from the soil with each year’s harvest. While it is true that farmers routinely add Nitrogen, Phosphorous and Potassium to encourage plant growth, adding these 3 nutrients does not replace all the trace minerals that have been depleted over all these years. So whereas once our soil was mineral rich, we now must turn to other sources for our trace minerals. It has been said that the problem most animals and humans face is starvation due to lack of minerals in the diet. Not lack of food, but lack of minerals. When the body doesn’t have the minerals it needs, it starts robbing from the bone structure or other parts of the body. At some point, different things begin to fail for lack of sufficient minerals. The body will take what it needs and cast off the rest. The one problem that we often see in our birds when insufficient minerals are not part of their every day diet is egg-bound hens during the breeding season. The problem with any one mineral by itself is that it can do more harm than good. Zinc, for example, can, by itself, suppresses your copper level, causing more problems than it fixed. The best solution, then, is a mineral supplement containing the entire recommended list, plus others that are suspected to be of importance. Most of these minerals should be in trace amounts. That is to say in parts per million or billion. One part per billion is like a grain of sand in a swimming pool, but its presence is vitally important. 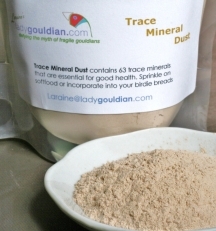 Our Trace Mineral Dust contains at least 66 and at most 72 trace minerals in a colloidal form. The particle size is in the micron or sub-micron classification, which makes it easily absorbed by the body. A supply of mineral powder should be provided in a separate finger drawer to your birds so that they can satisfy their own mineral needs during egg-laying - when large amounts will be consumed, when feeding young and during the peak part of their molt. 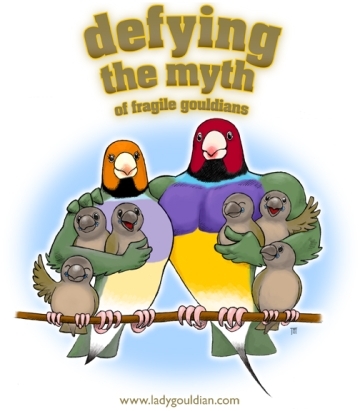 Another option for supplying Trace Minerals to your birds is with Dr. Rob Marshall’s F-Vite. This product not only contains a full compliment of minerals and trace minerals but it also has sterilized oyster shell.